Visiting Utah in the USA? There is no better way to see the extraordinary landscapes of this State; than by using a Salt Lake City motorhome rental as your vehicle of choice. Utah and her neighbouring States offer the visitor a host of unique attractions that bring thousands of visitors to the region every year. Book your motorhome rental in Salt Lake City, Utah; and join those in the know for the holiday of a lifetime. This is BIG territory…you can drive for miles without seeing a soul…having a Salt Lake City motorhome rental, campervan hire, recreational vehicle or RV rentals in Salt Lake City, USA means that you never have to waste time returning to a base camp each night. Unpack once, plot your route and start your unforgettable Utah adventure. Salt Lake City campervan rental depots are just 20 minutes from the Salt Lake City airport. Major USA companies have RV rental in Salt Lake City including Pure Motorhomes, El Monte RV rentals, Compass Campers, Moturis RV Rentals and Camping World as well as Cruise America motorhome hire. Compare motorhome rental at Salt Lake City online for the best deals. RV rental holidays are very popular here, and we have a large selection of motorhomes to rent, starting with an A Class or C Class motorhome for up to 3 adults and 2 young children, all the way to the largest Class C Freedom Elite which can accommodate up to 4 adults and 4 children. All the RV rentals in Salt Lake City vans come with a shower, toilet, cooking facilities and a generator. Some RV’s have additional luxuries such as TV, DVD and Air-Conditioning. If you are visiting in summer Air con is pretty much a necessity in this part of the world; so do check when making your booking – it is worth the extra cost! Where to go in your Salt Lake City RV rental? 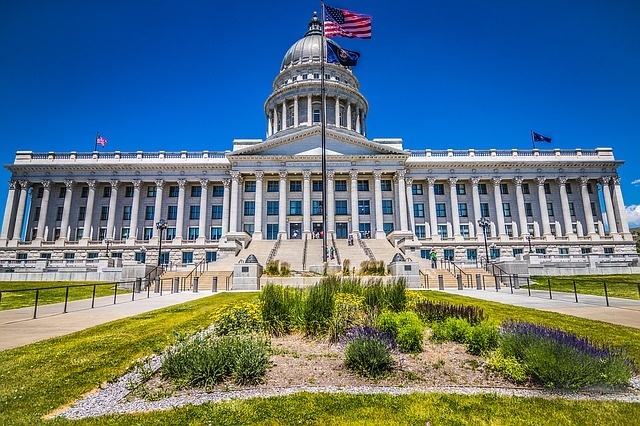 Firstly, you should spend a few days exploring Salt Lake City and surrounds, where there is a lot to see; there are several RV campgrounds very close to the city; and these are a great base if you are visiting in Winter to ski. Once you have seen SLC and the Utah valley, how about a grand 10-12 night round-trip including some of the major attractions and national parks in Utah? One option is to set out in your Salt Lake City RV rentals heading south-east to Moab, Monument Valley, Lake Powell and then the Grand Canyon. Book your RV campsite in advance if you are traveling in Peak Season! From the Grand Canyon you can visit Las Vegas and when you have had enough of the bright lights, head back into the wilderness to Zion National Park, Bryce Canyon and finally back to Salt Lake City. One-way drop-offs are also possible from our Salt Lake City depot, and you have the option to drive all the way to San Francisco via Yosemite and the very lovely Sonoma Valley, or carry on to Los Angeles and all there is to see and do on the West Coast.